In October 2014, ARTE's management decided to launch a refresh of its television news show. ARTE is a European public cultural broadcasting channel, based at Strasbourg, founded by France and Germany in 1991. Its mission is to encourage understanding among Europeans. It broadcasts to 165 million households, with 85% of its programs produced in Europe. The channel made a safe bet by entrusting the creation of the new backdrop to Philippe Désert, who proposed the concept, together with Christophe Valdéjo and Générale Studio. The basic idea was to immerse the viewer in the image while making the presenter stand out. It was decided to create a new set consisting of three video walls. This installation needed 20 professional screens: 12 landscape screens for the rear video wall, 5 portrait screens to the side and 3 screens placed beneath the presenter's desk. The aim was to be on air for the 7.30pm TV News on January 5 2015. Bruno Viti, the audiovisual project leader with ARTE's technology department had the job of making this project happen on a budget and within a timeframe of just three months. Perfect immersion in the image means that the video walls have to satisfy many aesthetic criteria (weight, size, sharpness of edges) and give flawless image quality while making broadcasting secure. For ARTE the new Panasonic screen, the TH-55LFV70 model, was a natural choice. These 55-inch video wall screens, with an ultra-slim bezel of just 3.5mm from screen to screen, combine high image quality with extreme reliability. Although display quality is especially important, continuity of broadcasting is vital because of the direct news output. An automatic switchover mode (Failover/Failback) is vital to avoid any breaks in transmission. With its two DVI-D ports, its HDMI, DisplayPort and USB ports with DIGITAL LINK technology, the video wall can switch automatically to an alternative feed if the main video signal is interrupted. The chosen solution therefore perfectly complies with the specification and all the technical must-haves, while also coming in under the channel's budget. The screens are installed on adjustable supports, to make it easier to replace them if necessary. In normal mode, each screen receives a full HD signal from Watchout* as its main source. In turn the Rescue mode enables automatic switchover to change input signals and ensure broadcasting continuity. As well as the server, the back-up images and videos can be loaded onto a USB key. This system can also be used to control various PJ Link functionalities such as turning monitors on and off, and switching inputs. Technical teams had very little time to work on adapting and upgrading the system. Adjustments were made that needed an extra week's work to find the right visual balance between the screen images and the news presenter. 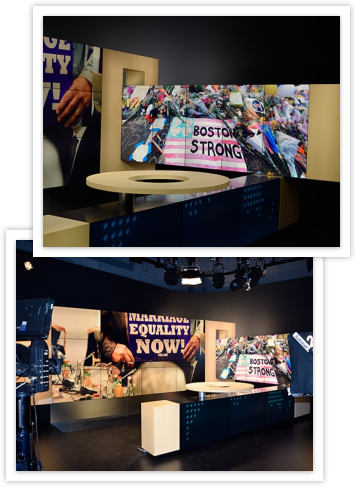 "We valued the involvement and follow-up offered by the technical teams, as this was the first time these screens had been used in the specific context of a TV studio. We worked together to perfect the system," added Bruno Viti, head of ARTE's audiovisual project. The new set went on air from January 12 2015. 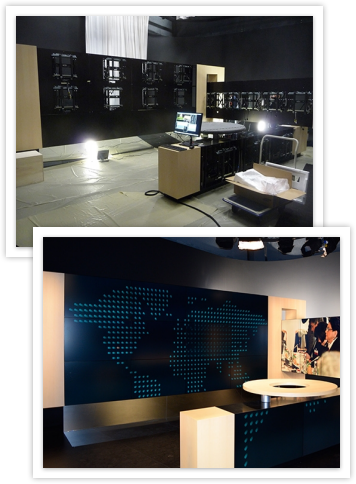 "The initial idea was to create an immersion experience, to avoid as far as possible the conventional configuration of desk with screen behind," said Philippe Désert, who along with Christophe Valdéjo, designed the décor for the Arte TV News set. "Our aim was to give television viewers the sense of diving into the image, so we naturally chose these slim-edged screens so that it is possible to zoom in, get tight close-ups and play with formats." "24 screens were bought altogether. Four months on, and with some adjustments in terms of content and editorial choice, we are satisfied. The solution gives an excellent balance of price and quality. We already knew the brand well and have been using Panasonic hardware for over six years with no problems," commented Bruno Viti. "The Panasonic screens perform as we hoped, the result is convincing and satisfactory, we have had no concerns. They are also easy to install. We also appreciate the flexibility and the innovative sense of the brand," emphasizes Philippe Désert. Born in 1984, the same year as a well-known pay-TV channel appeared on the French audiovisual landscape, Philippe Désert is one of the experts in television set design. In 2000, he founded "Générale Studio", now a major player on the décor market for the media, stage and events sectors. * The DATATON Watchout system is a multi-screen media broadcasting solution distributed in France by Videmus.